Town has reopened after the extended break. The main street was as busy as I’ve ever seen it, which is to say not very. This suits me fine. It also makes defence easier in a zombie apocalypse. I’m always thinking ahead. I picked up my mail from the post office. 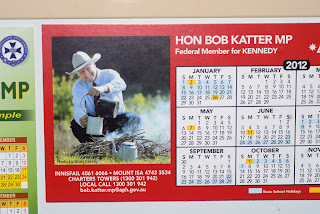 Hidden among the bills was my 2012 fridge magnet calendar from our federal member, Bob Katter. This year’s effort is a definite improvement on last year’s, which featured Mr Katter’s signature but no sign of the Man in the Hat. As you can see, our illustrious member’s beaming fizzog and trademark headgear are back. As is a demonstration of one of Katter’s Australia Party’s platforms — the freedom to boil a billy wherever you damned well please. And as badly as you like. 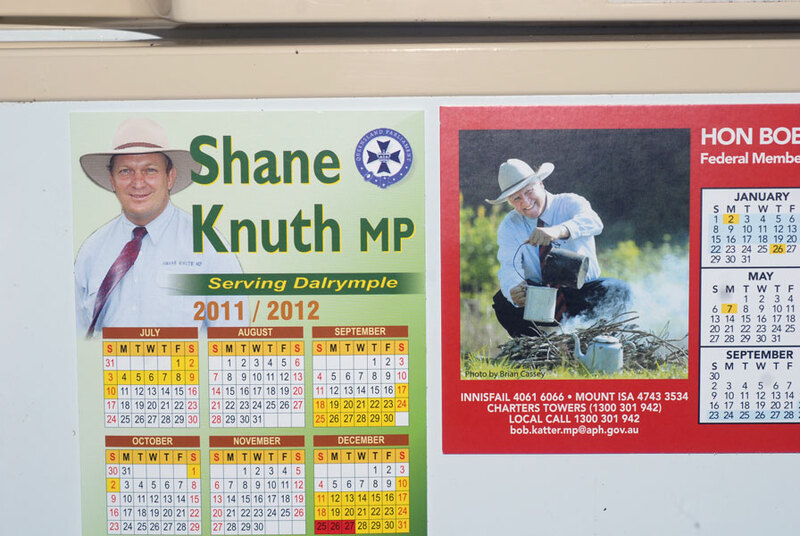 I am deeply disappointed that neither the photo of Mr Katter nor of our state member, Shane Knuth, has the hat deep etched. I have been a fan of deep etched hats ever since a friend who worked on a rural newspaper pointed out that if the main front page photo was of a man in an Akubra — especially a man in an Akubra accompanied by a kelpie or a cattle dog — the headgear would be deep etched. It’s tradition, you see. Like lukewarm billy tea. From 16 January, Atherton Library will be hosting From Ship to Shore, a travelling exhibition from the State Library of Queensland. The display features notebooks and journals from the SLQ's archives. Four of the diaries describe 19th Century immigration, another was written in the 1890s on board a South Sea Islander labour recruitment ship for Queensland’s sugar industry, and one is from a post-World War II immigration voyage. I've made a note about it in my diary. I should also probably mark it on the Katter 'n' Knuth fridge calendars. I will report on the exhibition in a couple of weeks. Just remind dear Bob that his Grandfather was a "boat person", back in the day. Re hats, I suspect nothing compares to the Bush Tuckerman's personally shaped and worn old trade-mark hat. That's awesome! Sadly, our local politicos don't wear colorful headgear as the warden doesn't allow hats in prison. Denis, I suspect the KAP's policies on immigration are as contradictory as all their other policies. I've read some of 'em and I can't made head or tail of them. Ah, I'd forgotten Les Hiddens' hat. A magnificently malformed titfer. Dave, that made me snort out my tea! We've also got pollies in prison, but surprisingly few. I'm gunna have to move to FNQ just to get me one of them calendars! Always been a fan of Bob 'As Mad As A ...'. Gives me something to laugh about during the evening news when he appears. Thanks Snail for your gift, a lovely surprise for the start of 2012. Felt strange but very enjoyable. And you also let it grace your fridge? I'm not nice at all, because after a quick browse and read, all those federal things go into the re-cycle bin with a wish for something good to emerge. The sense of time really feels to have been different then... a time filled with space for detail regardless of the challenges and difficulties the folk faced. Look forward to your Posting about the Exhibition. Did a quick visit via your local library link... interesting stuff they put on for Folk to enjoy and experience. Oh, you can laugh, Gouldiae, but they're both in Katter's Australia Party. This is even more embarrassing than the time I lived in Thuringowa and the electorate voted in not only a One Nation candidate but a One Nation candidate that was a professional Santa. Magda, I'm looking forward to visiting the exhibition at the library. I am a great fan of travelling exhibitions --- it's a long way to Brisbane from here! I am in two minds about the Katter 'n' Knuth calendars. One the one hand, both MPs drive me mad; but on the other, the calendars are quite handy and I hate waste! my mind's a little boggled about all that...i'm still waiting for my new 2012 calendar to arrive in the mail. Sometimes it's a bit difficult to tell. I went in today and saw three people, but that's a pretty normal Sunday. One Monday I went in and had to wait for twelve cars to pass before I could back out of the parking spot. Unheard of!